By Marjorie Corbman – 96 pgs. In this startling and enlightening book, Marjorie shares her own experiences as well as those of many of her friends, dismantling the misconceptions surrounding today’s teenagers. 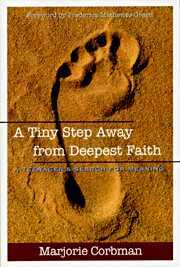 In this candid, thought-provoking account, seventeen-year-old Marjorie Corbman teaches the rest of us something about faith. She recounts her own experiences as well as those of many of her friends, dismantling with remarkable transparency and grace the misconceptions surrounding today’s teenagers. Chapters focus on issues and experiences that Corbman and her peers are searching for – such as intimacy, tradition, eternity, community, justice, escape – and how each relates to what Corbman calls “the one thing needful” – faith. Much has been written about teenagers, from self-help books for parents to young adult novels, but very little has been written by teens themselves. This is a book that is sorely needed, both for adults wishing to understand today’s kids, and also for those teenagers who wish to assign some meaning to their beliefs, sufferings, and searching.